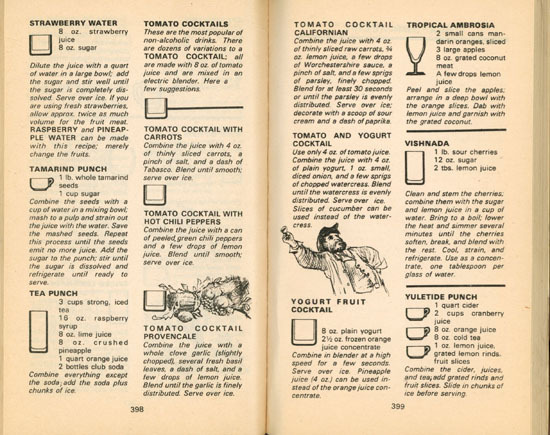 Cookbook #231: Complete World Bartender Guide, Bob Sennett, editor, Baronet Publishing Company, NY, 1977. Why did I buy this book? We rarely make “cocktails”. Guess I had a moment when I wanted to act “civilized”, like my parents’ generation, where fancy cocktails were routine at social get-togethers. Whatever the cause, I bought the book. 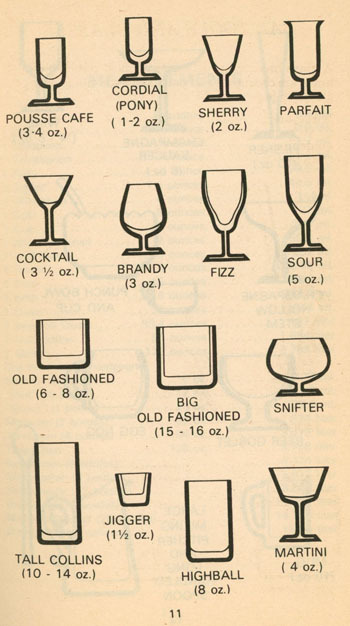 And the result was Complete World Bartender Guide sat my shelf, gathering dust. 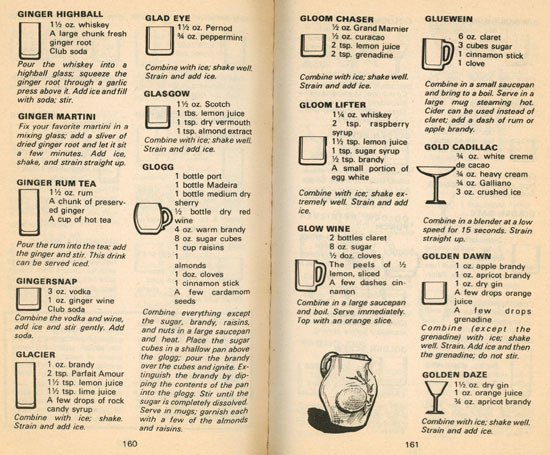 On occasion, I have poured over the multitude of recipes in the Complete World Bartender Guide. There are 356 recipe pages, and about 5-6 recipes per page. That’s about 2000 drink recipes! If I made one drink per day from this book, it would take me five and a half years to make them all! Hmmm. That might be an interesting topic for a new daily blog: “2000 Cocktails”. I’m sure it would lead to some amusing anecdotes. But no, I am not going to do it. Actually, this page might be useful to me in the future. 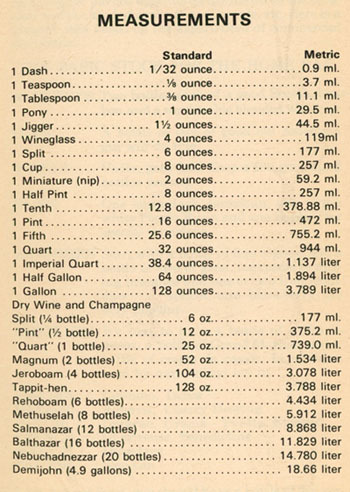 But I also have another recipe source for simple syrups in my comprehensive reference book, Food Lover’s Companion. As well as this simple syrup, Complete World Bartender Guide lists different types of liquors and liquers, such as sloe gin, armagnac, anisette, and dry gin. 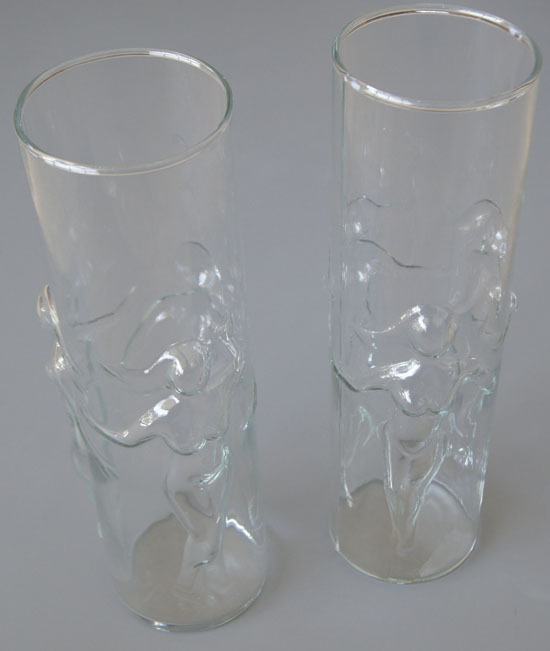 Is Food Lover’s Companion a good reference for these as well? It does lists the first three, but not dry gin. So if I recycle Complete World Bartender Guide, I might lose access to some important printed informaiton. My uncle served in World War II and was for a time a bartender. Spending an evening with my aunt and uncle was always entertaining! We have the best memories of our visits to their home in Southern California. Back to definitions, like sloe gin. What is it? It’s a liqueur made from the berries of the blackthorn bush, called “sloe berries”. Sloe gin is red and thickly sweet and sinks to the bottom of the glass, kind of like grenadine. And what is grenadine? It’s a flavoring made from pomegranates. Note that the sloe gin is red and has sugar and adds alcohol to the already potent Skip and Go Nakeds. Collins mix is masde with simple syrup, lemon juice, and soda water. 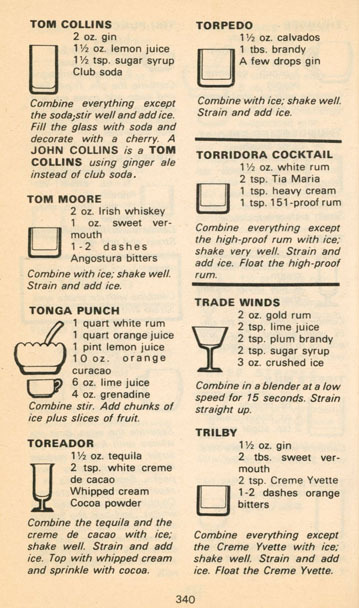 I could have used my Lemon Simple Syrup to make a Tom Collins. I should have looked on my own bookshelves for answers long ago. I will make the tomato cocktail with carrots. I keep small cans of tomato sauce in my pantry because I often use them when making marinara sauce. I took out a carrot to use, and wondered how much it weighed. Less than one ounce! This was an averaged-sized carrot. Heavens, I am supposed to use 4 ounces of carrots! That seemed way too much for me, so I only used that one 1-ounce carrot. Cut the carrot into very thin slices. Blend until smooth. Serve over ice if you like. Sure, this was good. 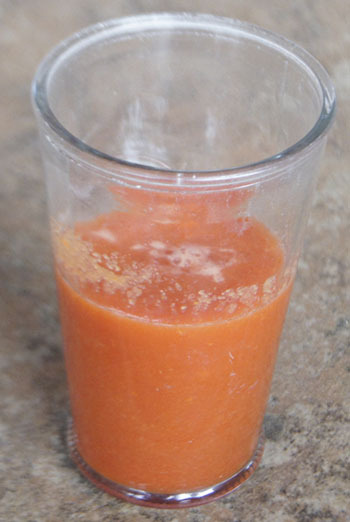 The carrots were still a bit crunchy after a minute of blending, though. I didn’t mind, but you might use carrot juice instead, or a juicer. 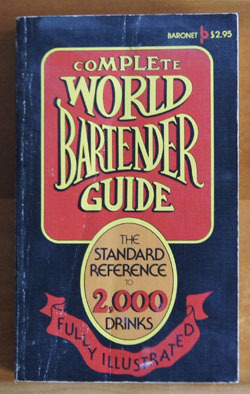 Shall I keep the Complete World Bartender Guide? I haven’t really decided. I meant to recycle it when I first picked it up, but I had some fun going through it, and might again in the future. I guess I’ll keep it for now! 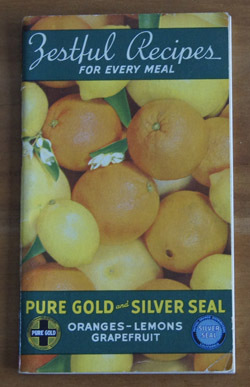 Cookbook #89: Zestful Recipes for Every Meal, Mutual Orange Distributors, Bruce McDaniel, Gen. Mgr., Redlands, CA, 19?? (see below). A colorful booklet catches my eye. Bright oranges, lemons and grapefruits adorn the cover. Because California Citrus Fruits are so luscious, so healthful, and so adaptable to all branches of cookery, it is with utmost confidence that we present this little booklet. My mind drifts back to the 1950s. 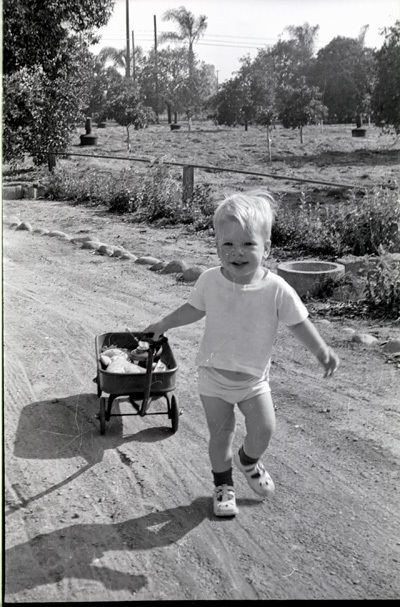 A little blond girl runs out to the trees in her backyard and picks a few lemons. Into the kitchen to hand-squeeze them and add sugar and water and ice for the best lemonade ever. Yup, that was me! Both my parents were born in citrus-kissed Southern California, and I was too. 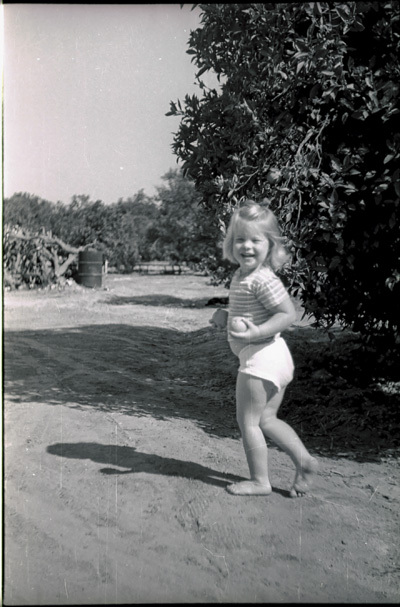 My mother grew up on a ranch where my grandfather grew oranges. You can be refreshed on the hottest summer day with a good, tart, icy drink, and for this purpose California citrus fruits are necessary additions to the larder. 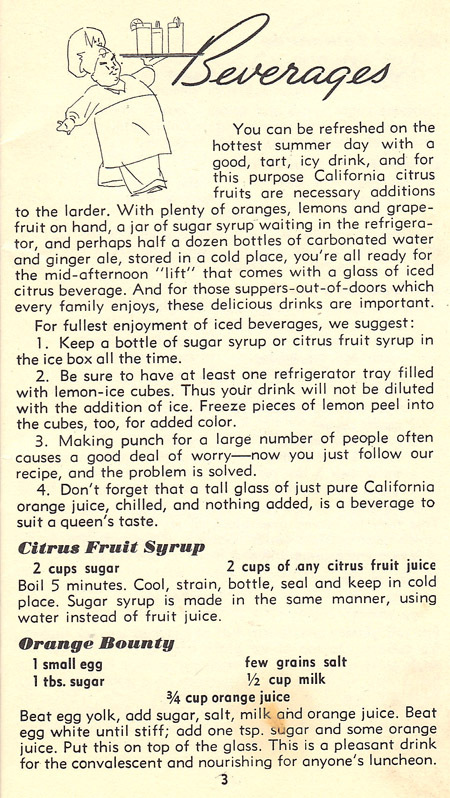 With plenty of oranges, lemons and grapefruit on hand, a jar of sugar syrup waiting the the refrigerator, and perhaps half a dozen bottles of carbonated water and ginger ale, stored in a cold place, you’re all ready for the mid-afternoon “lift” that comes with a glass of iced citrus beverage. 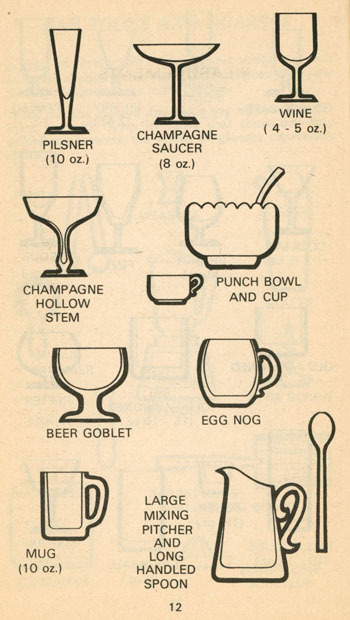 And for those suppers-out-of-doors which every family enjoys, these delicious drinks are important. I find no handwritten notes in Zestful Recipes, and just a few stains. I noted in my database that it came from my Mother. It’s just 3.5×6-inches, and quite obviously it was an advertising-recipe booklet. Shall I just toss it? Explore some more? I can’t find a publication date in Zestful Recipes. I google Amazon and find an entry’s photo that looks just like my booklet. It costs $10 and was published in 1940, according to the website (accessed November 2014). Hmmm. A little more searching. Wow, this is cool. I find the entire Zestful Recipes booklet, scanned to a digital image and available to the public! Check this out on the Hathi Trust website: catalog.hathitrust.org/Record/005601173. Go down to “viewability” and click on “full view”. That’s exactly the same booklet! Cute, its owner had written a recipe for meat loaf on the first page. My Zestful copy is a lot cleaner. The Hathi Trust site gives the publication date of Zestful Recipes as probably 1931. That means: This book is a Treasure! It is quite likely that my grandfather’s oranges were distributed by “Mutual Orange Distributors” (publishers of Zestful Recipes), way back in the first half of the twentieth century. His ranch was in the vicinity of Covina, near the cities of Glendora, San Dimas, Pomona, Claremont, and not too far from Redlands. That whole area was covered with orange groves when I was a child, and Orange County still had tons of groves when I was in college. I go back now and it’s mostly freeways and houses and strip malls. If you are interested, here are a couple links to more information on Mutual Orange Distributors and the history of the citrus business in Southern California. So it looks like my copy of Zestful Recipes could once have belonged to my grandparents, acquired somehow through their orange-growing business. My mother kept hold of it for decades, and now it is in my hands. I will keep it. I decide to make “Citrus Fruit Syrup” on page 3 of Zestful Recipes. 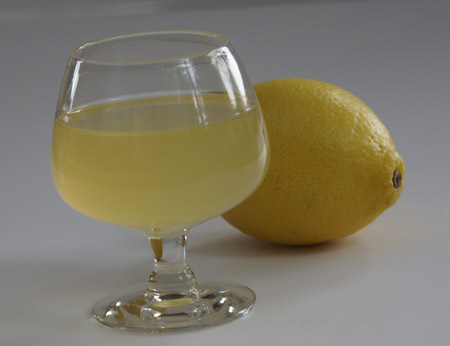 This is just a basic simple syrup, often used in beverages, both alcoholic and non-alcoholic. Like flavored oils and vinegars (see my entry for Michael Chiarello’s book), simple syrups are “pantry basics” that you can make for yourself. And if you are an ex-chemist (me! ), you just might want to do so! Combine the sugar and the juice in a pan on the stove. Bring to a boil and boil for 5 minutes. Watch carefully! Mine foamed up and boiled over when my back was turned. But it still turned out beautifully. 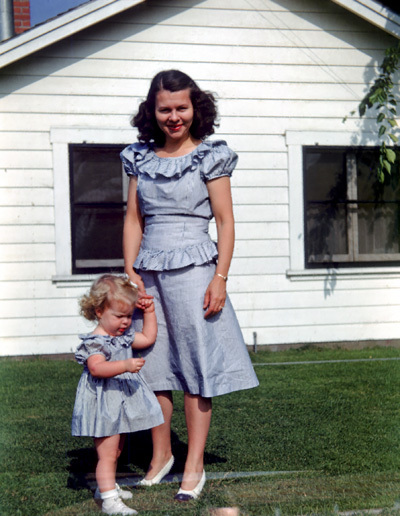 Here are some photos taken at Grandpa and Grandma Burch’s ranch, from 1947-1950. My sister at the ranch. That’s an orange in her hand! My brother “helping out” at the ranch. Mother and I at the ranch. I’m sure she made our dresses.